Australian racing grew in importance in the late 1950s, in part because of the success in Europe of Jack Brabham and his willingness to take ex-F1 cars back to his homeland to compete in the major races. CAMS organised a national drivers' championship for 1957, known as the Gold Star, and the first International was held at the end of 1958, attracting Stirling Moss as well as Brabham. New Zealand had been running their GP as an International since 1954 and attracting great fields, so in 1961 this was expanded to a series of races on both sides of the Tasman sea. Team Lotus, BRM, Yeoman Credit and the Walker team joined Cooper Cars for these races and over the next few years, the Internationals grew into the Tasman Cup. 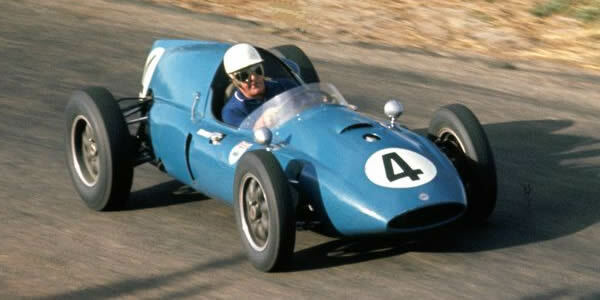 Brabham popularised the Cooper-Climax in Australian Gold Star racing and a large number of these were imported in 1959 and 1960, some new and some second-hand ex-Brabham works cars. Stan Jones, father of future World Champion Alan, Len Lukey, Alec Mildren, Lex Davison, Bib Stillwell and Bill Patterson were the leading drivers through this period, nearly all in Cooper chassis by 1959. The 1957-1959 seasons are still being researched but 1960-63, charting the run-up to the Tasman formula, are available below. The 1960 season: (Victorian Trophy at Fishermen's Bend), Longford Trophy, (Longford), (Phillip Island), Bathurst 100, Australian Grand Prix at Lowood, Lowood, (Bathurst), Port Wakefield, Caversham, Phillip Island, (Warwick Farm). The 1961 season: (Warwick Farm "100"), (Victorian Trophy at Ballarat), Longford Trophy, (Hume Weir), (Hume Weir), Bathurst, (Warwick Farm), Lowood, (Lakeside), Caversham, (Mallala), (Warwick Farm), (Bathurst), Australian GP at Mallala, (Hordern Trophy at Warwick Farm). The 1962 season: (Warwick Farm "100"), (Lakeside), (Lakeside International), (Calder), South Pacific Championship at Longford, (Sandown Park International), Bathurst 100, (Calder), Lowood, Sandown Park, Advertiser Trophy at Mallala, (Hordern Trophy at Warwick Farm), Australian GP at Caversham. The 1963 season: Australian Grand Prix at Warwick Farm, Lakeside International, South Pacific Championship at Longford, Sandown Park International, (Calder), (Bathurst), Sandown Park, Advertiser Trophy at Mallala, Hordern Trophy at Warwick Farm. The 1964 season: Australian Grand Prix at Sandown Park, South Pacific Trophy at Longford, Lakeside, Mallala, Hordern Trophy at Warwick Farm. The 1965 season: Warwick Farm '100', Australian Grand Prix at Longford, Sandown Park, Lakeside, Mallala, Hordern Trophy at Warwick Farm. The 1966 season: Lakeside, Surfers Paradise, Mallala, Sandown Park, Symmons Plains, Warwick Farm. The 1967 season: Lakeside, Surfers Paradise, Sandown Park, Mallala, Symmons Plains, Warwick Farm. The 1968 season: Bathurst, Lakeside, Surfers Paradise, Sandown Park, Mallala, Warwick Farm. The 1969 season: Symmons Plains, Bathurst, Sandown Park, Mallala, Surfers Paradise, Warwick Farm. The 1970 season: Symmons Plains, Lakeside, Oran Park, Warwick Farm, Sandown Park, Mallala, (Australian GP at Warwick Farm). The 1971 season: Lakeside, Oran Park, Surfers Paradise, (Warwick Farm), Sandown Park, Symmons Plains, Mallala, (Australian GP at Warwick Farm). In this list, Internationals are shown in bold and non-Gold Star races in brackets. Note that some races were classed as FPA (Foreign Participation Authorised) but were not actually internationals. The 1957 to 1963 Australian results have been compiled by David McKinney from a wide range of sources, including his own magazine articles and books. Many others have helped with the development of the Australian section of ORC and particular gratitude should be expressed to Barry Lake, former Editor of Cars and Drivers Australia, who passed away in July 2012. We still need entry lists to complete the picture of this period. Qualifying times are also missing for some races, as are the finishing positions of some of the lesser runners. Please email Allen (allen@oldracingcars.com) if you have any additions, corrections or comments.